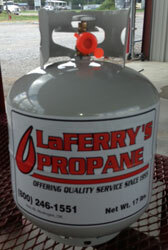 Laferry's is a locally owned and operated business. Your company will be dealing with local people, and the money you spend with us will go back into the local economy. No more hassling with tank checks and ordering. We will restock the cabinet as needed. In the unlikely event you do run empty on tanks, we will restock your cabinet within (1) one business day. Laferry's provides the cabinets and bottles at no charge. All we charge you for are the bottles you've exchanged or sold. We provide all testing and training to your employees.